Sanbutsuji temple is located on Mt Mitoku in Misasa town, Tottori Prefecture. It has been around since the year 706 founded by Enno Gyoja to train ascetic monks and then Jikaku Daishi Enrin enshrine three Buddhist statues. The name of Sanbutsu(three Buddhist statues)-ji(temple) came from this legend. The elevation gain is about 900m and its mountain road is one of the steepest roads of mountain temples in Japan. 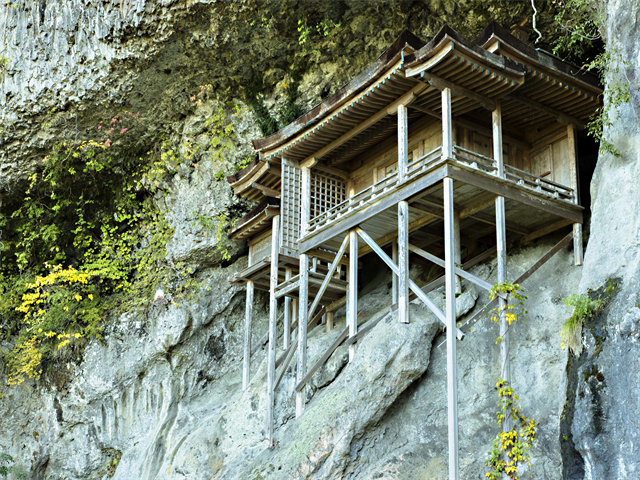 The most famous structure of this temple is Nageire Hall which was built on the cliff and it has been designated as National Treasure. When you enter the mountain, there must be two people or more and you have to put on the appropriate hiking shoes.